As reported by University City Patch back in January, St. Louis County would like to remove a section of Delmar Blvd from its arterial road system and turn control over to another government entity, most likely University City. Specifically, the county would like to divest the .65 mile section of Delmar Blvd running through The Loop from Big Bend Blvd to the St. Louis city limits. County traffic engineers estimate the annual cost to University City at $36,000, though University City officials argue the amount could be much greater. The St. Louis County Department of Highways and Traffic does periodically remove and add streets to its arterial road system. The character and demand of streets, afterall, changes over time. But it’s disappointing to read the County’s reasons for wanting to discard this section of Delmar Blvd. Delmar Blvd anchors The Loop—one of the great commercial neighborhoods in the St. Louis area—and has long been the principal arterial of University City. The Loop’s eclectic mix of shops and restaurants attracts people from all over the St. Louis area. 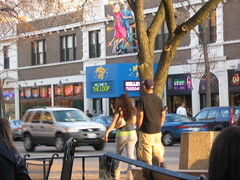 The success of The Loop is the reason Delmar Blvd was recognized as a “Great Street” by the American Planning Association in 2007. So why would any government agency not want to take pride in ownership of one of the great streets in America? According to St. Louis County, it’s because traffic doesn’t move fast enough… due to all the pedestrians and parked cars! What’s troubling about the quotes above is that they suggest that the St. Louis County Department of Highways and Traffic has little to no concern for the communities its “arterial” roads run through. They suggest that the department is not interested in using it’s streets to create, maintain, or hold together places and neighborhoods. They suggest that the only thing the department is worried about is the quick and expedient movement of cars. 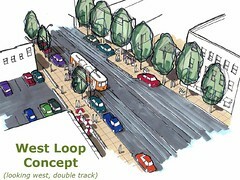 Concept sketch for the Loop Trolley. There’s no denying that there’s a lot of congestion on Delmar Blvd through The Loop and that many drivers avoid The Loop for that very reason. But to a certain degree, that congestion is on purpose. It forces people to slow down, to have a look around, to interact with their surroundings instead of just shunting themselves from place to place inside their vehicles. Congestion on Delmar Blvd says that The Loop is a place where people want to be. Thus, the argument comes down to defining the purpose of an arterial road. St. Louis County argues that an arterial road’s purpose is move as many vehicles as quickly and efficiently as possible enabling long distance travel. The County, however, is ignoring that streets can be arteries for pedestrians, transit, and commerce, as well. The County’s assertion that a “main street” with pedestrians and parked cars cannot be an arterial road is especially ridiculous. Its assertion ignores even local examples such as Kirkwood Rd in Kirkwood, South Grand Blvd in Grand South Grand, and Main St in Edwardsville. In the end, St. Louis County is free to maintain whichever roads it chooses. But municipalities that have invested in commercial centers and created vibrant districts should not pay a penalty for doing so. We should be providing incentives for such development. Kirkwood Road (US 61/67) is actually State-maintained. So is Manchester Road (MO 100) though downtown Maplewood.But if MODOT can maintain these "main streets," it's a little embarrasing that County Highways can't do the same in the Loop. I'm not overly concerned with who maintains which roads. I did want to point out that, whereas Delmar is considered a minor arterial by East-West Gateway, there are other "main streets" in the region that are considered primary arterials. The mere presence of pedestrians and parked cars should not make a road any less important in the eyes of our regional governing bodies. Placing financial burdens on others while relieving another entity from its financial responsibilities are well known, recognized and accepted St Louis traditions. My point (1st Anon.) was it's pretty sad if the State DOT (MODOT) is able to maintains more "main streets" in what is the most populous county in Missouri than the actual local DOT (County Hwy's) directly serving such an "urban" county. I think a better way to put it would have been to say that people generally don't drive through delmar anymore. Its not a feeder arterial from the City (Delmar gets blocked a couple times in fact in the City), and people generally avoid using it as a through street because of the congestion. This is what an arterial is, a through street that distributes traffic to local streets. Delmar is a great street, and if the County had a great street program, it should be there, but it doesn't. The other examples you give, Grand, Manchester, and Kirkwood are arterials that people drive through all the time. They also don't dead end at the end of the district, instead they are some of the longest continuous streets in our community. Clearly they are arterials..in fact the state says they are more than arterial. Um, Delmar runs continuously from Downtown to past the Innerbelt. If that's not an arterial, I don't know what is.